the wrong-read words a coaster to reassure me. blurry early morning eyes none the wiser. yesterday i was awaker than usual and read the truth. 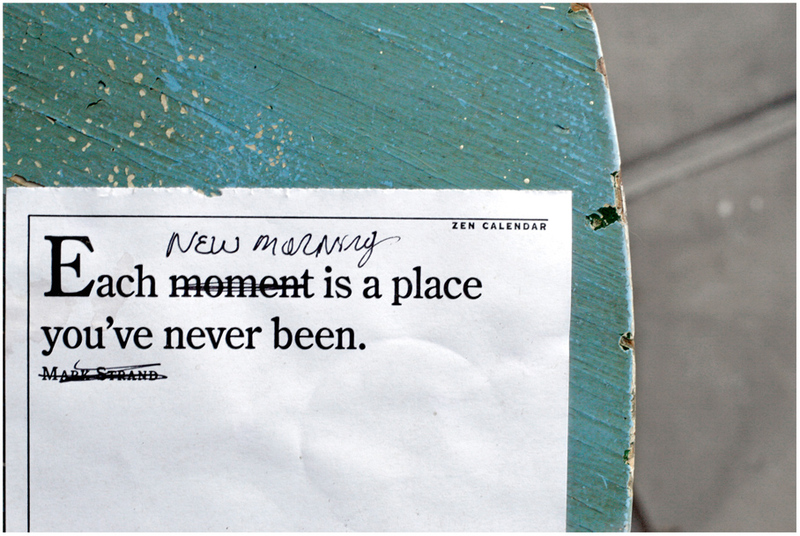 i like my each new morning version better. the ever-wonderful michael asked the other day how long it would take before he stopped saying he was going to run over to ask his dad something, his heart knowing immediately he couldn't, his dad gone the night before halloween. and i said forever. a long time. you will be saying the words wrong for a while. you are standing in a new place - it takes a while to remember the solid feel of land. a year ago today i had the last conversation with my mother i would ever have. it was on a monday last year, and last night felt like the real year ago; i said a thank you to the moon and stars for the hours we waited in the emergency room, no idea that the laughter we shared that evening would be the last. the next morning i would be standing in a place i'd never stood and i would stand there through the rest of february, not on solid ground, but at sea, in storms, leaning into the wind. it would take a long, long time to lose my sea legs. this month i feel them stirring, the memories of last february close to the skin. forgive me if i wander to those days a bit - i won't stay long. i have hearts to photograph, words of love to tell you, and i promise they will come. but for today, in this new place i stand, one year past hearing my mother's laughter, but still weeks from saying goodbye, i have only these words. it is a gray day and there are birds happy in the trees. despite the freeze warning for tonight. i hear my mother's laughter behind the notes. I was out early this morning, as usual, and there must have been ten times more birds singing than there have been all winter. I stopped and listened a while, enjoying the fresh songs in the crisp air. Now I know why they were here, and there with you. That laughter is large and widespread. you made me smile really big. thank you. Posts like this squeeze my heart. It is too much to imagine; a little too much to bear. Still, your words and Michael's and the imagery you both use is poignant and beautiful and I am thankful for it. each new morning, yes, you step out with your bravery and the birds and yes, i'm sure you hear her laughter. this is still something i can only imagine, or rather, i can't imagine, and sea legs help with the process i think, bending more than breaking, forcing us to navigate slowly through unchartered territory. keep that song in your heart. This post squeezed my heart a little too. I had this moment last night, this fleeting thought that I wanted to talk to my Dad about something, followed by the realization that I can't ever talk to him again, that he's been gone three and a half years now and I still can't seem to stop wishing it weren't so, to realize the finality of his passing. I sometimes get a little mad at him, for being so hard to miss, for leaving such a hole in my life. It's the birds chirping and the gardens blooming that make me miss him even more, but remind me of all that he loved and all that he taught us to love, and I feel some whisps of peace, but never acceptance. This is uncharted territory. We march on, it is all we can do. Keep writing, it helps a little, I think. beautiful and sorrowful ... it's been two years since my dad died and even though we werent actually close (literally as well as figuratively) I still find myself tripping on the thought that I'll tell him something ... but ... I don't know that ever passes? Yes, I do remember those legs being knocked out from under you. So glad you are hearing the birds sing again. oh .. this made me catch my breath .. you know how the tears spring to your eyes before you even realize it. Have I told you lately how much I find myself in your writing and what a gift that is to me. bless you in all of it. i am struck deep within my heart. i feel this very way many times but am too afraid, too embarrassed to verbalize the feelings. i am told too often: move on. i can move on only after feeling what i need to feel. if i stuff the feelings, it's no good for me. if i stuff the feelings, i'm not honouring the memories. still trying to leave a message. YES, i am human. are they? I thought i had left a message yesterday...but it looks like it didn't register. Your words are full of such sorrow and wisdom. Thank you for sharing such a personal experience.